U.S. Geological Survey scientists confirmed Wednesday that another large quake was triggered by an explosive eruption at the volcano's summit. The mag 5.4-magnitude quake shook the Big Island on Wednesday amid ongoing eruptions of Kilauea. The resulting quake causing an ash-cloud rising 10,000ft into the Hawaiian sky and dropping ash on surrounding communities. Another 450 quakes of all magnitudes from 0.1 to 5.4 hit the Big Island yesterday the Big Island has been rattled by at least 12,000 quakes in the last month. 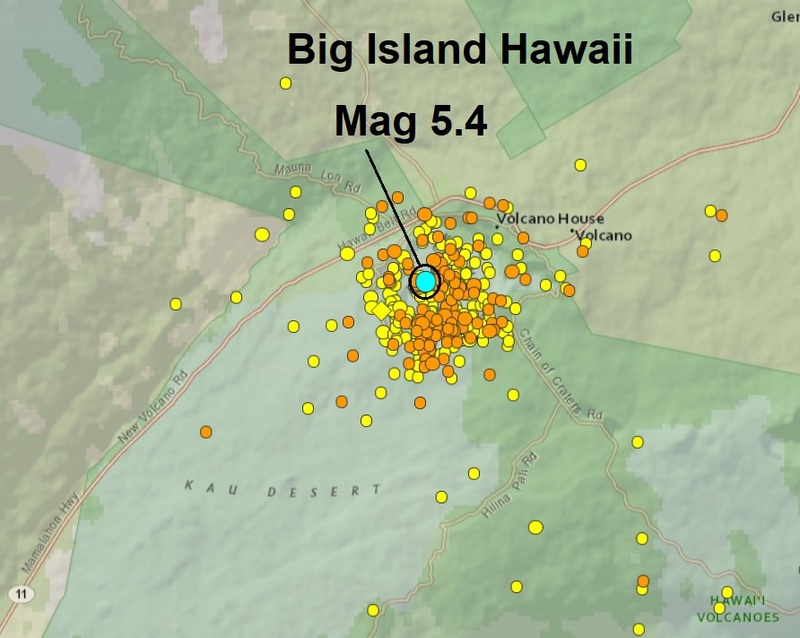 According to Hawaii News Now.com, most are centred at the summit of Kilauea volcano, and the vast majority are small (under magnitude 2.5) but there have also been a number of bigger quakes. Earlier this week, several temblors above 5.0-magnitude rocked the Big Island. But the biggest quake so far associated with ongoing eruptions of Kilauea was on May 4, when a 6.9-magnitude tremor shook the island. The temblor was felt as far away as Oahu and caused some minor damage. Chip McCreery, director of the Pacific Tsunami Warning Center, said the quake was the largest to strike the Big Island since November 1975, when a tremor centred two miles off Kalapana Beach was measured at a magnitude 7.2.